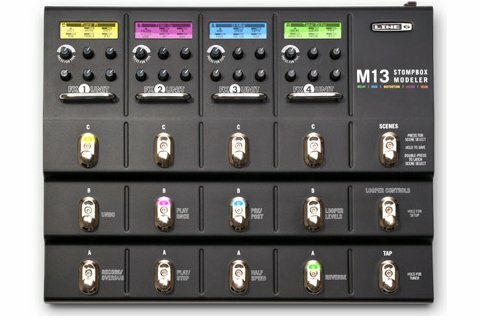 Late last year, Line 6 ramped up their strategy to claim a larger stake in the Multi-Effects arena. The flagship series they constructed to spearhead the entry, was the POD HD series. Before this series, the market was largely dominated by a handful of large companies, namely Digitech, Boss, and a few others. To this day, these large companies still hold the large share, but that all may change in the future. So I plug this thing in, on comes the first preset, “01A: 65 Clean”. Beautiful. I strum an E chord, and what I felt can be summed up in one word; power. This unit has it, and boy does it give it. In each tone, it may not be what you want, but believe me, it’s powerful, and each preset has a lot of body to it. So that’s my beginner experience. But the more time I got to spend with the POD, the more it outlined what I liked and didn’t like. (Yes folks, there are some things I don’t like). It’s a bull. Drop it, stomp on it, kick it, it just doesn’t care. And with it’s all metal construction, it shouldn’t. Besides, how can any guitar player take a floor unit seriously if it’s flimsy and plastic? The expression pedal was mighty squeaky before a lube, but damn it’s smooth. And once it’s calibrated, it’s everything I could want in a pedals function and feel. A wah-whenever, wherever. Yes people. Yes. 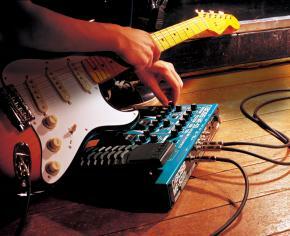 With a click of a switch, you can transform a basic tone into a wah-heavy ride of fury. This may seem like a small achievement to some players, but I love this feature. I was tired of pushing 10 buttons and twisting knobs to get a wah when I wanted it. Get loopy with it. 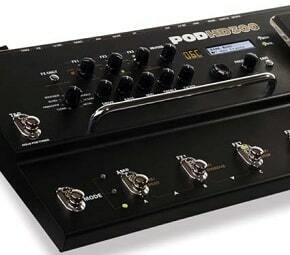 This particular built-in looper gives you many options—24 seconds of play time, overdubbing, and a play once feature, just to name a few. All tones are created equalized. An onboard EQ makes it easy to get quick results in a flash. Amplify the possibilities. Line6’s classic amp model selection knob is right on par as usual; easy to use and get to. God save the tones! – A one-touch save feature allows you to save your personalized presets for later, easy access. L33T 50FTW4R3. Yes, I really just did say that in leetspeak. All jokes aside, the online software available for this unit is a great addition to the arsenal of tools L6 offers here. “Just taaap it in.” A side bonus to the Looper is the “Tap” footswitch. The side bonus is that you can use the tap feature to actually control your effects’ timing, not just the looper. Now, for the cons; keep in mind, some of what I didn’t like on this pedal may not be so bad for you, so some of this may be personal preference. Effects, effects, effects, oh my! Seriously, the overwhelming majority of the presets are slathered with effects. I suppose this is a good idea for a display model, or for someone reviewing it, but as a straight consumer, sometimes I just want a straight tone, ya know? What screen? The display screen is pretty, and has a nice backlight, with clear text, but it’s just too small. I can’t imagine squinting at a gig just to get a look at my preset. Slow ride, take it hard. This is my largest issue with the POD. It is virtually impossible to do anything on the fly. Almost all of the big changes you could want to make to a tone, especially effects, must be done beforehand, and saved to the pedal for quick switching. Round round, get around, I don’t get around… This walks hand in hand with my last comment. Not only is it difficult to get something done quickly, it’s also difficult to navigate up and down through the presets. JUST GIVE ME A FLANGER! On this model, the effects are split in two sections: The first section is located in the FX1, FX2, and FX 3 knobs. The second set is located within each preset, which can be dealt with by pressing the “Presets” button. The issue here is that by pushing “Presets” you are presented with an entirely different set of effects. The idea of the two sections, and the “Swoosh” feature is great in concept, but wound up confusing in practice. I CAN’T DO IT CAPTAIN! I DON’T HAVE THE POWER! This seems to be an extremely common with many, many users of the POD HD series. 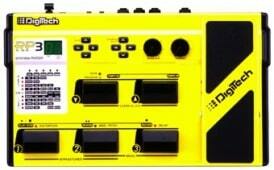 In order to activate the expression pedal, the user must activate the “Toe Switch”. Doesn’t sound too hard, until you try. Firstly, there is no actual “Switch”. I pushed and stomped and desperately tried to activate the pedal, and nothing worked until I stood on it with one foot and applied all of my body weight to the task. The good thing is that once you do it a few times, it becomes progressively easier to do. At the end of the day, I give this pedal a 7.3/10. It really has some very cool things on it, and seems to be a good friend in the writing, recording, and performing stages. I would like one myself, and I suggest you try it for yourself!